The fourth candle in our wreath represents Love. Dear friends, as we light this candle may we also remember that we are His light. We are as He is in this world! Isn’t that an astounding thought? Do we love as He loves? Do we put others ahead of ourselves? Do we testify to Jesus’ birth, death, and resurrection without fear? Do we have complete confidence as we approach His throne? Do we love not only our friends but also our enemies? If so, if we remain in Him and He in us, then we are the Light of World! I confess that I am not there yet: not yet perfect in love, not without fear, not confident, not selfless. But I am thankful that He is perfect and that He who has begun this good work in me promises to see it through to completion. Because of Him, yes, even I am the Light of the World! 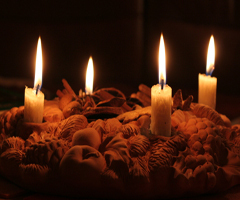 Four candles: Hope, Peace, Joy and Love. Four flames to light the world. Four beacons to show the way. Like a bright star in a very dark sky. Jesus is here! The Light of the World. The Way. That Light shines in darkness, yet the darkness does not overcome it—will never overcome it! The true light, who gives light to everyone, was coming, is coming, and has come into the world. He is here. Hallelujah! He is here. Amen … and Merry Christmas! “But the angel said to them, ‘Don’t be afraid, for look, I proclaim to you good news of great joy that will be for all the people: today a Savior, who is Messiah the Lord was born for you in the city of David’” (Luke 2:10-11). Good news! 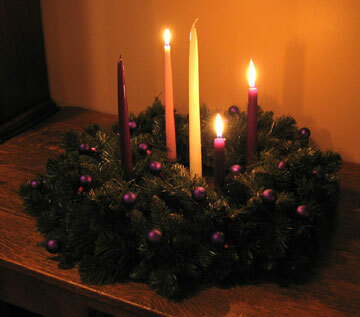 The third candle on our Advent wreath is the Candle of Joy. And not just “joy” but “Great Joy!” As you can already tell by my liberal exclamations, joy is something to get worked up over. Oh yeah! Joy is a very good, even great thing to have. And what was bringing the shepherds who heard this message such joy? A Savior was born. A Messiah had come for them. It was a message of inclusion to a people who were outsiders. Dirty, stinky shepherds. People who polite society ignored. People who spent their time apart from the rest. A Savior was born for them! Amazing! Can you imagine their relief? Can you imagine their joy? And that wasn’t all. This Messiah, this Savior was born for “all the people.” No longer would there be a wall between God’s chosen people and the rest of us. No longer would there be a glass of separation against which most people could only press their dirty noses and watch the workings of God. No! Now a Savior was born “for all the people.” And this Savior would tear down the walls that kept us stinky, smelly, sin-fouled beings away from the Holy God. Jesus was the Way to reach through the walls, to tear down the veil, and even to touch the righteousness of God Himself. What good news! What great joy! And it wasn’t just for them—those to whom the angels appeared on that faraway night. This Great Joy is still here for us today. Do you feel it? Joy—delight, happiness, bliss, ecstasy, elation, thrill! Don’t be afraid. Open your eyes and look. A Savior is born for us! He knows that we aren’t perfect. He knows that we aren’t clean. But, the angels told the shepherds to look for this great joy and so should we. Do you see what I see? This joy is Jesus. He was born for them, and He is born for us. He adopted them, and He adopts us. He covered their filth, and He covers ours. Good news! Great joy! Jesus is here. He is God with us and, yes, for us. Immanuel! Let the bells ring out and the people sing. Joy to the world, the Lord is come! Oh yes! Joy to the world! For God has blessed us every one! “And the peace of God, which surpasses every thought, will guard your hearts and your minds in Christ Jesus” (Phil. 4:7). 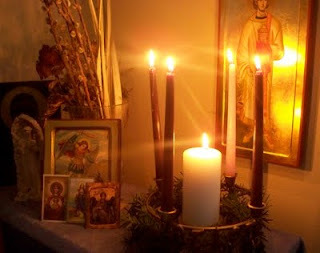 Last week we lit the first candle on our virtual Advent wreath: the candle of Hope. We celebrated the Hope we have in Christ and recognized that all good things come from Him and through Him and return again to Him. This week, we re-light Hope and add to it the candle of Peace. Peace? At this time of year? It does seem a little out of place, doesn’t it? Just this morning I read the Facebook statuses of many of you who were bemoaning the busy-ness of the season. There are gifts to buy for family, friends, teachers, co-workers, neighbors, and charities. Just the time and money investments alone are enough to zap the peace right out of even the jolliest Christmas elf. As one friend noted, there just doesn’t seem to be enough of us to go around. How do we even begin to celebrate Peace at this time of year? In his letter to the Philippian church, Paul wrote some practical counsel to finding the peace of Christ Jesus. He began by recommending spending some time in praise. “Rejoice in the Lord always. I will say it again: Rejoice!” (Phil. 4:4). If you are like many others, busy times take you out of your ordinary schedule and interfere with your usual routine of prayer, devotion, Bible study and worship. How can you really “Rejoice in the Lord” during the holiday season? Without pouring more stress and guilt into your life, how can you set aside some time to rejoice in the presence of the Prince of Peace? It may require an “as you go” approach, but it will be worth the effort to worship Him truly as the Christ of Christmas. The next thing on Paul’s “Peace List” is to “Let your graciousness be known to everyone” (Phil. 4:5). This may be a tall order for some. (I’m just saying.) It’s not easy to be gracious to everyone especially when you’re trying to find a parking spot at the mall or return that purchase that you found cheaper at another store. The pushy driver who pulls into your place or the rude clerk who only wants to give you store credit instead of the cash you expected doesn’t really deserve grace. Ah, but that’s what makes it grace. And to remind us of the grace we ourselves have received, Paul adds, “The Lord is near.” He is here and is coming again, and that is our motivation as believers to take care in our treatment of others. Less conflict leads to more peace for everyone. Next, Paul writes, “Don’t worry about anything, but in everything, through prayer and petition with thanksgiving, let your requests be made known to God” (Phil 4:6). Instead of worrying about gifts and parties and cooking and whatever else is on your list today, how can you hand it off to Jesus in prayer and with thanksgiving? Jesus has the power to help us accomplish “anything” we need to do and the wisdom to reveal to us “everything” that may not be required of us after all. “And the peace of God, which surpasses every thought, will guard your hearts and your minds in Christ Jesus” (Phil. 4:7). Peace in Christ. Of course, at Christmas. He is here. The Prince of Peace has come into the world. How can you celebrate His coming with peace in your heart? By doing “what you have learned and received and heard and seen … and the God of peace will be with you” (Phil 4:9). Hallelujah! Amen! “Arise, shine, for your light has come, and the glory of the Lord shines over you. For look, darkness covers the earth, and total darkness the peoples; but the Lord will shine over you, and His glory will appear over you” (Isaiah 60:1-2). Christmas is coming. Can you feel it? I know, I know. Thanksgiving was only one week ago. The stores have been decorated since October. You’ve received enough catalogs to obliterate a large rain forest. Every charity you’ve ever helped has called or will soon. You have baking to do, parties to host and attend, and a list of gifts to buy that seems nearly impossible to conquer. Yes. I’m sure you would say you’re feeling it by now. Christmas is definitely coming. But that’s not the feeling I mean. I can’t really put my finger on it—I’m usually a Scrooge myself by this time—but for some strange reason, this year feels different. Maybe it’s because my husband and I took the kids to the mall to buy their own gifts or maybe it’s that I’m getting less persnickety in my “more mature” years (probably not), but this year is definitely different. Fresher? More real? Yes and no—it’s the same story after all. God sent and is sending light into the darkness. He shone and is shining over us. His glory appeared and is appearing over us. The same story. The same bright star. The same angels and shepherds. But unexplainably, a new Hope is here. Like our newly purchased, ultra bright, LED lights, Jesus has come and has pierced through the darkness of the peoples—and through the cynical shell of my hardened heart. Yes, something is different this time around. Can you feel it, too? This Sunday begins the Advent season—the traditional time of devotion that many believers celebrate by lighting five symbolic candles set in an evergreen wreath, one candle each Sunday prior to Christmas and the fifth on Christmas Eve. 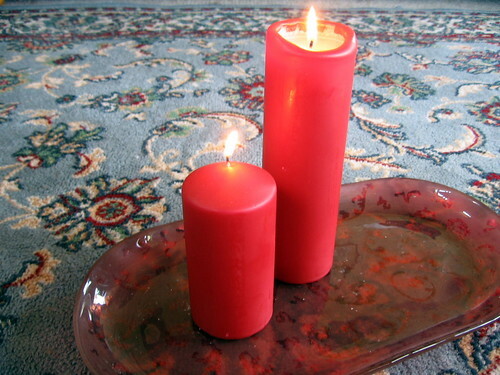 The first of these candles represents Hope. Jesus—the Light of the world that shines in the darkness and is not overcome. He is the hope of our calling, the hope of glory, a living hope, the reason for the hope that is in us as believers and the reality of all that is hoped for. Jesus came. Jesus is here. And Jesus is coming again. Can you feel it? Does this truth make a difference in your life and in this time of year? Oh yes, Lord. I know it should—and for some reason, this year I feel, I mean I really believe, that it does. You, Jesus, are my Hope! Is it my heart that has changed? If so, I know that I have had little to do with it. Cynical as ever. Still a skeptic. The “Bah Humbug” of the house. I am not the reason for the change. But as this first candle reminds us, my hope is not in me. Jesus is the one who changes us. Like my salvation, my sanctification does not depend upon me. Despite myself, I am being transformed into His image. It is not my work but His. He is the faithful one, and my hope lies in Him alone. He has been at work in me since last December to bring Himself glory and to bring me joy. A little more Tiny Tim and a little less Scrooge. God bless us, every one! Yes. Christmas is coming—in my house, in my church, in my neighborhood, and a little more truly this year than last, in my heart. His light has come and is coming again, and I can see Him with new eyes. Jesus Christ is the radiant Hope of all who are called by Him. No longer conformed to this world, but transformed and renewed. “Then you will see and be radiant, and your heart will tremble and rejoice …” (Isaiah 60:5). Can you feel it? Oh, I hope you can.